Today we had a little party for Naiya's first birthday. Just a small gathering of family and no pinata. Our big girl had her very first sugary sweet treat. Before attacking the cake though, she ate all the kiwi garnish! That beautiful child loves her kiwi. Mostly she patted the cake (just like the song says) and licked the frosting off of her hands. We went to the zoo today. We thought Naiya would like the lorikeets but those colorful little birds are really loud and I don't know if she thought they were attacking her mommy but they made her cry and daddy had to take her out of the atrium. Naiya is standing up a lot today. She holds onto furniture (the desk, couch, cabinets, etc.) grabs some object and then gets so involved holding it and investigating just standing there that I think she just forgets she's standing...hands free. When she realizes it she usually plunks down on her bottom. She has stood there though for as long as a minute or so. Lately her favorite game is pulling all the books off the bookshelf. She does this upstairs in the hall with her board books and also in the front living room she has cleared off the entire two bottom shelves of its, hmm...40 or 50 or so books. In other news, our little lovely had her first taste of meat the other day... canned cat food that she got off the floor. Yummy. Last week Ryan had his "bachelor weekend" (is it possible to still call it that?) camping on the Oregon coast. On the last day, after all the boys had gone home, Naiya and I joined him for our first camping trip as a family. 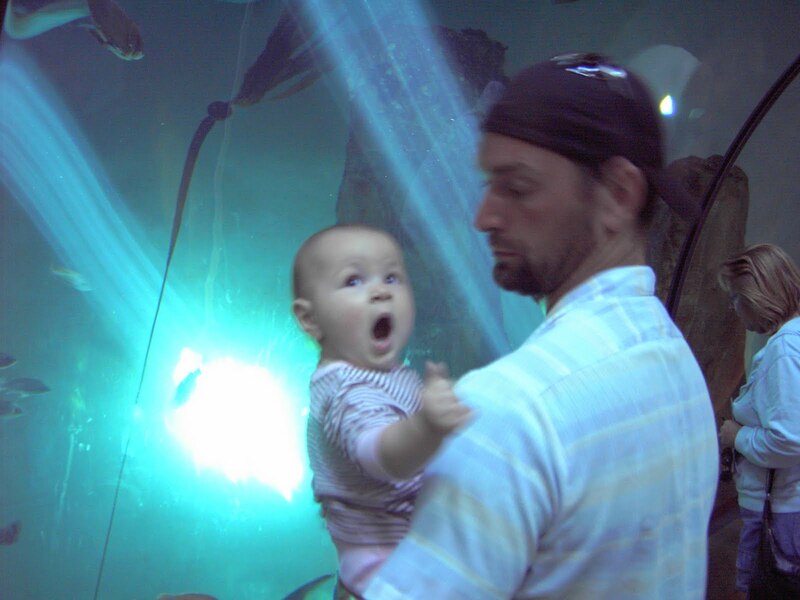 We only stayed one night (Naiya woke up about every hour) and the next day went to the Aquarium in Newport. I'm not sure if she liked camping but Naiya did seem to really enjoy the fish and sea critters. Unfortunately, it is not easy to photograph underwater through double plexi-glass or in the dark exhibition halls, but we ended up with some interesting pics.